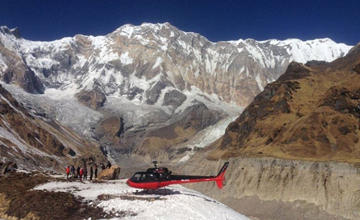 Muktinath Helicopter tour is one of the most popular adventure package trip in Nepal. 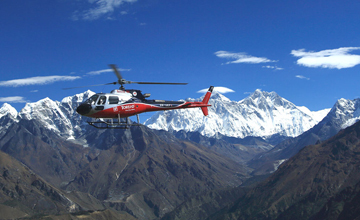 Muktinath Helicopter tour offer beautiful Himalayan views two above 8000m mountains ( Mt. Dhaulagiri 8167m & Mt. Annapurna I 8091m) with 18 snowy capped mountains , Holy Muktinath temple ( Salvation temple) , Tibetan monasteries, beautiful landscape with Tibetan culture. 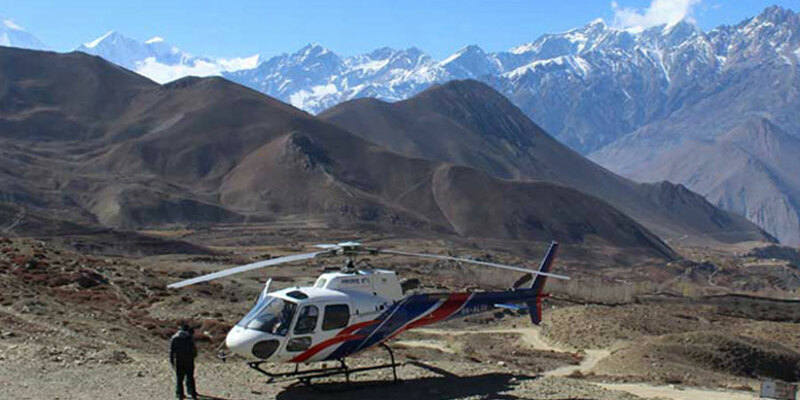 Muktinath Helicopter tour created for Hindu pilgrimage who haven’t enough time through overland journey to Muktinath or on foot trekking to Jomsom Muktinath. As believe in Hindu religion If someone make crime / sinful and visit the muktinath temple ( salvation temple) & splash holy water in the body, those people avoid their crime / sinful so many Hindu people at least visit in Muktinath once for lifetime journeys. 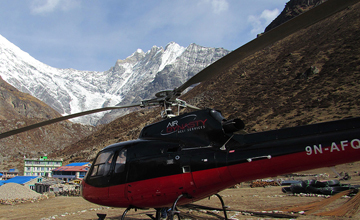 Normally, we Himalaya Journey Trekking arrange Muktinath Helicopter tour around the year as per travelers wish and desire. After 30 minutes scenic Helicopter flight land just in front of the Muktinath temple. Pilgrimage / travelers will get one hour time for pray & excursion the Muktinath temple. During this period pilgrimage will visit Jwalamukhi mai where travelers can see the flame over the holy water. Travelers / pilgrimage can see beautiful Himalayan views of Mt. Dhaulagiri 8167m, Mt. Nilgiri 7041m & beautiful landscape of Mustang region. 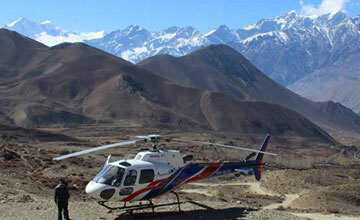 Muktinath Heli tour can do all age groups travelers / pilgrimage with life time journeys in High Himalayan holy temple. Day 02: After breakfast, Himalaya Journey Treks & Expedition’s tour guide will take to for historical monuments sightseeing in Kathmandu valley such as Boudhhanath : visit Bodhnath Stupa, one of the best Buddhist shrines in the world, where we observe Buddhist monks in prayer in the monasteries surrounding the stupa than visit Pashupatinath: the most famous Hindu temple in the country, located on the banks of the holy Bagmati River. Here you see Hindu holy men (sadhus) meditating, pilgrims bathing and occasionally funeral pyres burning on the ghats. Kathmandu durbar square: you will enjoy with different Hindus Temple , Goddes Kumari, legend of kathmadu valley etc .and prepare for the Mukintah Helicopter tour . Overnight at Kathmandu. Day 03: After breakfast, HJT guide will take to you pokhara (915m) by tourist bus or by flight . transfer to Hotel. Kathmandu pokhara overland tour by tourist bus is included in trip cost but if trekkers / travelers prefer private vehicle or flight will have to pay extra. Day 04: After breakfast , Pokhara by helicopter fly to Muktinath (3802m), fly approximately 30 minutes. One hour time for pray & excursion around Muktinath then fly back to pokhara. Day 05: After breakfast Pokhara , by bus/private vehicle or by flight back to Kathmandu & in the evening farewell dinner in Nepalese Restaurant, overnight at kathmandu in Hotel . Day 06: After breakfast, Relaxing/shopping with own activities , Himalaya Journey Treks & Expedition's representative will drop to Kathmandu international airport for onward journeys or if you have time to stay in Nepal will arrange any other trip such as Chitwan Junlge safari tour, Lumbini tour, Chitwan jungle safari tour , river rafting etc.